Dwight, Illinois is a pretty little town of some 4,500 residents whose motto is “Not Just A Bump in the Road,” which you’ll find to be a true if you take the time to stop and explore this old Route 66 town. It all began in the early 1850s when two railroad surveyors by the names of James Spencer and T.C. Myer camped near what would soon be the town of Dwight. Within a few years, the railroad was built and when the first Alton and Sangamon (later the Chicago and Alton) train came through from Chicago to St. Louis in 1854, there were just two small wood buildings and a water tank. They called the “station” West New York. However when Richard P. Morgan, another survey engineer, was asked to give the place a name, he suggested Henry Dwight of New York who had invested a fortune into the building of the railroad. And so it was. 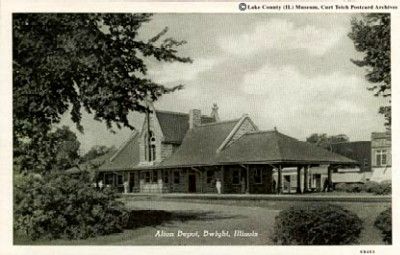 At this time railroad stops often became towns and Dwight was no different. Morgan went on to build the first mill in 1859 and donated the land for the Presbyterian Church. A man named David McWilliams soon built a store that did a booming business during its first year. 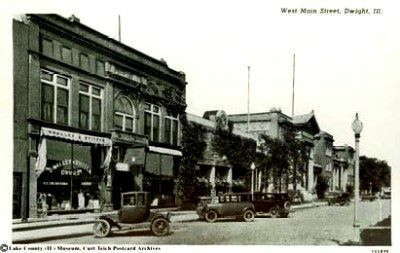 Later he would help to build the first school in town and started the town’s first bank, now known as the Bank of Dwight. In 1879 Dwight was a still a quiet railroad town when young Dr. Leslie Keeley opened the doors of the Keeley Institute, the first medical institution to treat alcoholism as a disease. By the 1890’s Keeley Institutes were located in nearly every state in the nation and many overseas. When Keeley died in 1900, his partner and friend, John R. Oughton, became president of the corporation. Oughton renovated a building that was used as the Keeley Club House and adding to it, made it his home, which was known as “The Manse.” Today, the building operates as a restaurant with large banquet facilities and is called the Country Mansion. The Keeley Institute continued to operate until 1966 when hospitals began to deal with the disease of alcoholism. Today the building houses the Fox Developmental Center. When Route 66 barreled through town, it bypassed Dwight’s downtown district, so the town responded with new businesses along the highway. Big Al’s Hot Dogs in Dwight, Illinois, September, 2004, Kathy Weiser. 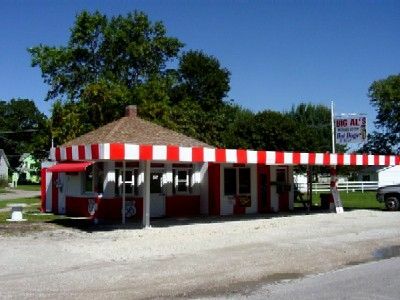 Big Al’s Hot Dogs will be one of the first things you see as you enter Dwight on Route 66. Soon you will pass Ambler’s Texaco Station. 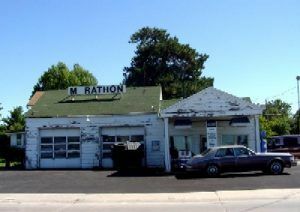 Built in 1933, it later became The Marathon Oil Station and serviced travelers until 1998. The building is currently being restored by the community and will serve as visitor’s center. 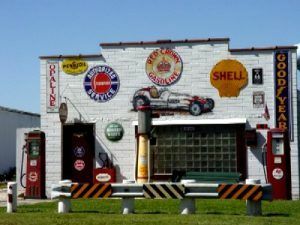 Further on down the road you will see another Route 66 era station that has been decked out with all manner of gas station paraphernalia, and Feddersen’s Pizza Garage, an old car dealership that has been converted into a pizzeria. Off Route 66, in downtown Dwight, there are several historical buildings that the town has taken care to preserve. The beautiful stone railroad depot, built in 1891, houses the Dwight Historical Society and the Chamber of Commerce. This building is on the National Register of Historic Places. Also downtown is the First National Bank building designed by Frank Lloyd Wright in 1905 and the former Keeley Institute, with its priceless stained glass windows depicting the five senses. The Prairie Creek Public Library, housed in an old carriage house, The Country Mansion, the Pioneer Gothic Church, and the historic Windmill in the City Center, are all also on the National Register of Historic Places. Your next stops on ole’ Route 66 are Odell and Pontiac, where you are sure to see lots more of the Mother Road era. The Ambler-Becker Texaco Station, built in 1933 later served as Marathon Oil Station until 1998. One of the longest running stations on Route 66, the community of Dwight had plans to restore it as a visitor’s center when we were there in September, 2004. This old station in Dwight as been decked out with all kinds of gasoline paraphernalia, September, 2004, Kathy Weiser. Click for prints & products. The Texaco Station is fully restored and open to the public. Dwight is more then a place to just see. It’s a place to stay a while. Sit and talk with the locals. Possible to even put down roots. Now I may be biased as we moved here almost a year ago. Amazing architecture throughout the town. not just the mansion or train station. The history is here and still alive and welcoming. Amazing people. Great food. Come stay a while. a week, a month, raise a family or Retire here. It’s a great place to be.